Sincere apologies, but Toronto Kimono Club does not do rentals. We do, however, have strong ties with Fuuga Kimono, Toronto's first and only kimono rental service, owned and operated by one of the founders of the Toronto Kimono Club, Kisa. 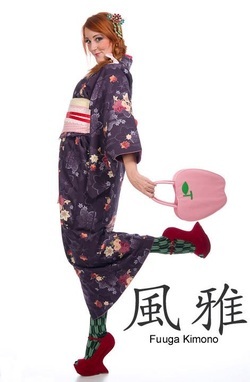 She can do modern styling of kimono, such as Kimono-Hime, or provide you with something traditionally acceptable to wear to tea ceremony or a wedding. You can find Fuuga Kimono online (links below), or you can drop them a line at kimono.fuuga (AT) gmail.com. If you are looking for a kimono for a temporary display, we have connections to the community and may be able to source something for you. Please send inquiries to toronto.kimono (AT) gmail.com.